Today I’ll be reviewing an expensive knife. There is no way around it. The Rockstead Higo retails for the better part of $1000. It’s insanely expensive, and it’s taken me the better part of 10 years of writing about knives to work my way up to purchasing one. I’ve considered it before, but always had something else I’d rather spend $800 on. Like food, rent, and child support. But recently I got my priorities straightened out and purchased a Rockstead for review. So it may come as a surprise to hear that the Higo is actually one of Rockstead’s least expensive offerings. You can easily spend $1,500 to $3,000 on one of their knives. The Higo is one of their simpler, more utilitarian models. Relatively simple duraluminum handles and a single stand off house a beautiful, smoky black DLC coated blade. And it’s not just any blade, it’s Rockstead’s beautiful “HONZUKURI” double convex blade shape brought to a flawless mirror polish. Yes, it’s high time we reviewed a Rockstead, and examined this knife in all of it’s expensive glory. By the way, I am writing this review from a cardboard box. The Higo has an overall length of 8.5″, a 3.5″ blade, weighs 3.6 ounces and is made in Japan. It’s a larger knife but could be EDCd if you like the idea of daily carrying an ultra high end pocket knife. I think it is one of Rockstead’s more staid models, but personally, I wouldn’t EDC this thing. Not only is it too expensive for me to use without feeling guilty, I have major reservations regarding how I would sharpen the knife. I’ll comment on that further below. The Higo comes with a long drop point blade. The tip on the knife is fairly high, and it provides a rather abrupt belly. The blade is saber ground, and there is a hole in the flat of the blade with a short milled fuller. I am not sure if that’s for decoration, or is part of the manufacturing process. I never think too hard about that because my eye is inevitably drawn to the beautiful mirror polished primary bevel. As an aside, this polished blade is a bear to photograph. My photography has never been great, but I apologize for the especially schlocky photos accompanying this review. I did my best to keep my mug out of the photographs, but there are still all sorts of reflections in the shots showing the blade. Rockstead’s process for finishing the blades this way is time consuming, and labor intensive. This is part of the reason why Rockstead knives are so expensive. Rockstead does a reasonable job explaining the process on their website. Apparently someone hand sands these blades starting at 400 grit going all the way up to 2000 grit. Then additional finishing work is done on the knife through some proprietary processes that are well beyond my pay grade as a lay person. The net result is the most beautiful blade I have ever laid my eyes on. The grinds are beautifully crisp. The machining is outstanding. And the mirror polish is flawless. The net result is stunning. There is nothing else like a Rockstead blade. Rockstead offers the Higo in two blade steels: a DLC Coated YXR7 version (shown here) or an uncoated ZDP-189 version. YXR7 is a high speed tool steel manufactured by Hitachi. YXR7 has the enviable combination of being tough, but also being able to be heat treated to a high hardness. Here is a link to the zKnives data sheet on YXR7. Rockstead states that it’s the durability of the YXR7 that allows them to put an ultra thin 3 micron thick coat of DLC over the blade. Paired with a less shock resistant steel, the DLC coating would crack like an egg shell. But when paired with YXR7 the shock is dissipated and you are left with an otherworldly blade. Each knife is individually checked for hardness, and Rockstead reports that on the information card that comes with the knife. My particular knife was heat treated to 65.2 HRc. Impressive. OK, this is normally the part of the review where I comment on the real world performance of the knife after extensive carry and use. That never happened with the Higo. It’s just too nice of a knife for me to get down and dirty with. Furthermore, I’m concerned that if I used the knife I’d be unable to sharpen it. Especially this DLC coated variant. With the ZDP-189 version you can probably maintain the edge with careful stropping. But here, only a teeny tiny bit of the edge is exposed. The rested is coated in DLC. How the hell do you sharpen this thing? Rockstead offers a “free sharpening service” but you need to ship the knife back to Japan for that. Sorry guys, but I didn’t want to go down that path with this knife. I will say I’ve been to the Rockstead booth at Blade Show a few times and they had many samples available, and they would cut phone books and rope with the knives at the show. They can certainly cut, and from what I understand they hold an edge unlike anything else thanks in part to the insane hardness and unique blade geometry. Compared with the magnificent blade, the handle is a little less interesting. It’s still beautifully machined, but lets face it, few things can stand up to the blade of a Rockstead. Here we have black anodized duraluminum handles. A pleasant wave pattern has been milled into the handles. Execution of the handles themselves is great, but one area leaving me wanting a little more is with the hardware. The hardware almost appears like cheap pot metal compared to the blade. I’d love to see some decorative hardware or polished hardware to match the blade. As it stands, it appears more like an after thought. At this price everything needs to be special. I have no complaints in the ergonomics department. This simple and straight forward handle design. There is plenty of room, and an absence of excessive curves and ‘ergonomic features’ means that the handle will be comfortable for most people. That said, you do get light jimping on both the top and bottom of the blade, toothier jimping on the handle, and a finger choil. All of this stuff has been exercised with a degree of restraint to the point where it all plays in the background. It’s the ergonomic equivalent of muzak. Present, but hard to register unless you pay close attention. The pocket clip is downright primitive compared to the rest of the knife. It’s a DLC blackened spring style clip, mounted high on the handle for deep carry with a single torx screw. There is nothing wrong with any of this, but it is crudely stamped “MADE IN JAPAN”. Not the end of the world, but not the most elegant solution either. Given the attention of detail lavished on this blade I would have expected a little more. The good news is that the pocket clip works great, and the knife carries well. It’s a long knife, but thin and lightweight, so you don’t notice it much. The pocket clip has good spring retention, so it keeps the knife planted in place, and it all but buries completely in your pocket. Not bad, but not amazing either. The clip is also a fingerprint magnet. Much like the blade. The Higo primarily makes use of dual thumb studs to get the blade open. The thumb studs are prominent, and the blade is easy enough to open with either hand. Additionally, the exposed tang when closed gives you the option of a “front flipper” of sorts. You can’t actually flip the blade open, but you can get the blade mostly open with this faux flipper. The blade rotates fluidly on generous phosphor bronze washers. It isn’t a fast deploying knife, but it feels purposeful. The frame lock of the Higo engages with a soft click. It’s an aluminum framelock with a stainless steel lockbar insert. I think it is interesting to note that the lockbar insert has also been given the DLC treatment. Little details like that are good to see. Frankly I expect them on a knife this expensive. Lockup is a solid 50% and there is zero blade play of any kind. I struggled to find a good knife to use for the size comparison section. The blade of the Higo is so tough to photograph, that I ended up choosing the Zero Tolerance 0450CF. The matte DLC blade on the 0450CF made it possible to get a workable photo. Blade centering is absolutely perfect on my knife. Once again at this price point I would expect nothing less. On one hand the Higo is a stunning knife. The blade is unlike anything else I have reviewed. It’s an otherworldly work of art. You simply won’t find anything else like it on the production market. That beautiful blade is combined with an elegant handle. It is a juxtoposition of Japanese elegance and their fanatical pride in what they do. Rockstead has taken the production pocket knife to extremes few of us would consider. In these ways the Higo is a truly special knife. On the flip side I don’t think this is a particularly practical knife. It’s so expensive I’m hesitant to use it. And if I were to use the knife, it would be damn near impossible for me to sharpen it. Perhaps if I selected the non-DLC coated variant I could strop this thing, but I don’t know how I would sharpen this DLC coated blade with its impossibly small microbevel edge. The only answer is to send it off to Rockstead. They will sharpen it for free provided I can prove I’m the original owner, but I would need to ship the knife to Japan at a considerable expense and risk. For these reasons I cannot recommend this knife as a daily carry, unless you are a talented sharpener and willing to use a near $1,000 folding knife. Most people won’t do that, and of the few that will actually purchase a Rockstead Higo, I suspect they will treat the knife like I have: gingerly. With so many great $50-200 folding knives in my collection, the Higo has been relegated to a safe queen and curiosity. It’s a beautiful safe queen, but a safe queen none the less. I recommend purchasing the Rockstead Higo at BladeHQ. Please consider that buying anything through any of the links on this website, including Amazon.com, helps support BladeReviews.com, and keeps the site going. As always, any and all support is greatly appreciated. Thank you very much. Looking to Buy a Rockstead Higo? Buy mine! Looking for a Rockstead Higo, but don’t want to pay $800.00+ for one? Buy my review sample for only $650 shipped within the U.S. I wish I could keep this knife, but I can’t keep them all, and I must make room in my collection and budget to buy more knives to review. It is in LNIB condition and the knife has not been registered with Rockstead yet. Contact me if you are interested or leave a comment below with your email address and I’ll reach out to you. Thanks! I don’t know about you, but sometimes I lust after knives for months, or even years, before pulling the trigger. That was the case with this Zero Tolerance 0450CF. The original 0450 was cool, but the carbon fiber version put me over the top. It’s a little lighter and sleeker, and the choice of green anodized accents isn’t something you see on a lot of knives. I decided I wanted one, but could never find a decent deal on it. Fast forward a couple years later, and I received a trade offer that included this 0450CF. Right on. I immediately responded back that I was interested, and a few days later the knife was at my doorstep. By way of a more formal introduction, the 0450 series is a riff on the original Dimitry Sinkevich designed 0454CF that I reviewed back in 2014. Chad McBroom reviewed the mass marketed 0452CF and Ben reviewed the shrunken down full titanium 0450. I’ve got the ultra light 0450CF for your consideration today. The 0450CF has an over all length of 7.375″, a 3.25″ blade, and weighs a mere 2.45 ounces. Like all Zero Tolerance knives, the 0450CF is made in the USA. The 0450 and the 0450CF are reactions to the knife market. Zero Tolerance is know for large overbuilt knives, but they received feedback that everyone didn’t want to carry around a big honking pocket knife. So the 0450 hit the scene, and then this 0450CF took that even further by replacing the titanium show side handle with carbon fiber. This shaved over almost half an ounce off the already lightweight 0450. This, my friends, makes for an ideal EDC knife in my book. The 0450CF shares the same low slung blade that made us all fall in love with the 0454CF when it hit the scene. It’s a long, sleek, modified drop point blade, featuring a little belly and plenty of tip. The knife has a high flat grind and a decorative swedge. The blade has been given a semi-glossy black DLC coating. The edge has been uniformly applied, and there is a sharpening choil so you can easily sharpen this blade from tip to heel. ZT opted for S35VN for the blade steel. Regulars to the site or high end knives need no introduction to S35VN. It’s a high performance stainless steel from Crucible designed specificaly for pocket knives with the help of Chris Reeve. It’s an excellent all round blade steel and a good choice for small pocket knives like this as it offers a good balance of edge retention, toughness, and ease of sharpening. I like S35VN generally, and they did a great job with the heat treat on this 0450CF. As always if you want to dive deeper into blade steel check out our steel section for all sorts of additional info. Practically speaking this little 0450CF is a capable cutter. The blade shape is perfect for getting under envelopes, breaking down boxes, cutting fruit, and performing all the little odd ball chores I require of my EDC knives. That said, I must agree with Ben that this knife is not the best slicer. The partial flat grind binds up in material. While it cuts, it’s no Alox Cadet. This is probably my biggest gripe with the knife. The S35VN blade has held up great, and so has the Diamond-Like Carbon (DLC) coating. DLC coatings are among the best money can buy, and unless you scrape this knife on concrete or metal it will hold up well. The handle of the 0450CF is a solid piece of carbon fiber on the show side, and a black DLC coated titantium framelock on the reverse. The knife is held together with two green aluminum standoffs and an oversized pivot. Construction is simple yet elegant. All the hardware is black save for the green anodized standoffs. The fit and finish is exceptional. The screws are all the right length, the parts line up perfectly, and the finish work is excellent. The carbon fiber is lightly textured, and shimmers slightly in the light. This handle has been beautifully done. The 0450CF is a small knife, but it doesn’t compromise in the ergonomics department. Dimitry’s design is simple and it should work well for most people. I take an “XL” size glove and have no problem getting a full four finger grip on this knife. There is a short row of jimping on the spine that provides you with a little traction and something to index your thumb on. Beyond that there is not much in the way of texture. That’s fine by me as I don’t think this knife needs aggressive texturing. It works well as is. The pocket clip is a standard parkerized black spoon style pocket clip. It’s relatively discreet and unobtrusive. While it’s not a true deep carry clip, it buries the majority of the knife in your pocket and keeps the 0450CF tucked away. The clip is swappable for right or left side tip up carry. A deep carry clip would have been nice. I have carried this knife quite a bit. The 0450CF is a knife that you forget you are carrying. At just under 2.5 ounces this is not going to pull your pants down. The clip has great retention and the knife stays where you want it to in your pocket. This is a Dimitry Sinkevich designed flipper made by Zero Tolerance, so the flipping action is outstanding. The detent is perfectly tuned for crisp, snappy flipping action each and every time. I’ve never “flubbed the flip” with this knife and I’d say the action is a solid “8” on the 0-10 scale. It’s good. Inside you have a caged bearing system. It is exceptionally smooth and you can shake the knife closed easily. Please note I’m a lefty, so I don’t have any issues with putting my fingers on the lock bar when flipping the knife. I tried flipping this 0450CF with my right hand. Beside it being incredibly awkward for me, it works fine. No issues flipping open this knife. I think ZT fixed the issue that plagued their earlier knives. For lockup we have a titanium frame lock with a stainless steel insert. Zero Tolerance does such a good job with these, that I almost feel that writing this section is unnecessary. The lock bar engages early and securely. The lockup is rock solid with zero blade play in any direction. The lock is smooth and easy to manipulate with no lock stick. This is titanium frame lock perfection and continues to be something of a gold standard in my world. Blade centering is dead nuts center on my knife. Ben was a little lukewarm on his 0450. He didn’t like the way the knife cut, the ergonomics, and he had issues with the action. Aside from that Mrs. Lincoln tells me the play was OK. I think Ben raises valid points. A little knife like this should zip through stuff, but the combination of narrow blade and partial flat grind impacts the 450CF’s slicing performance. It still cuts, but it could be better. Personally, the ergonomics were spot on for my hand, and I found that the 0450CF flipped great. Ergonomics will vary from person to person, and I think ZT addressed the flipping action. All in all, I am glad I picked up this little 0450CF. It’s as cool in person as I always hoped. I like the look of it over the standard 0450 and how it’s even lighter with this carbon fiber handle. The 0450CF is an excellent little EDC knife in my book. With a retail price at close to $200 it’s not cheap, but I’m glad I went for it. The 0450 is probably ZT’s most practical EDC offering for the average person. This carbon fiber version takes things up a notch. Zero Tolerance 0450CF; Folding Knife with 3.25” DLC-Coated S35VN Stainless Steel Blade, All-Black Carbon Fiber and Titanium Handle Scales, KVT Ball-Bearing Opening, Frame Lock, Pocketclip; 2.45 OZ. 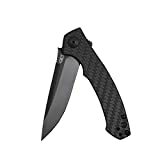 I recommend purchasing the Zero Tolerance 0450CF at Amazon or BladeHQ. Please consider that buying anything through any of the links on this website helps support BladeReviews.com, and keeps the site going. As always, any and all support is greatly appreciated. Thank you very much. First of all, this is not really a review. The 0888MAX is a pure collectible for me. A collectible I was able to acquire through a trade with my good friend Andrew of the Edge Observer. The knife has been admired and “fondled” (as much as I hate that word – it’s right up there with “hubby” and “moist” for me), but certainly not carried and used. Given the value and rarity of a knife like the 0888MAX, I hope those who came here for a rough and tumble review can look past that and enjoy the knife from the same collector’s mindset that I have. It seems as if Zero Tolerance has lost their way in some respects with their recent limited editions. To me knives like the 0777>, the 454CF, and this 0888 represent the pinnacle of ZT’s limited editions: bold and innovative designs that are beautifully and meticulously executed, featuring feats of engineering largely unseen in their regular lineup, yet the knives are still timeless and universally appealing. A 0392 with “toxic green” hardware doesn’t get me going in the same way an 0888 does. The 0427 is cool, but a little busy. It is more of an acquired taste, than a timeless classic. I have similar feelings about the 0999. To me they just gratuitously layered on more stuff, like a chef at a fancy restaurant simply piling on more expensive ingredients. There is something about the 0888 that places it the top my favorite ZT LE’s. Maybe because it is an in house design, so simple and elegant yet so meticulously and beautifully rendered. The gentle play between the open blade and handle, the fully contoured titanium scales, and the ingenious one piece pocket clip that flows seamlessly with the rest of the knife, all serve to elevate this design from the rest. There is something almost magical about the 888, made even more etheral by the limited quantity: a mere 250 pieces of the 0888 and 250 of the 0888MAX. These days Zero Tolerance limited releases even seem to be less limited. But that’s OK, this only serves to make the 0888MAX more special. The 0888MAX has an overall length of 9.125″, a 3.75″ blade, a weight of 7.56 ounces, and is made in the USA. I will use “0888” and “0888MAX” interchangeably throughout this article except for when specifically discussing the steel below. With that said, the difference between the 2 is that the 0888 is uncoated and comes with a composite S110V and 14C28N blade, while the 0888MAX is black DLC coated and approximately half of the 0888MAX knives feature Maxamet steel, and the other half have M390 steel blades after Zero Tolerance realized it would be too difficult to finish out the entire batch in Maxamet. Also the fuller on the regular 0888 does not extend the length of the blade like the 0888MAX. The 0888 was apparently the 2012 Overall Knife of the Year. Although I agree with Tony that this is an award of dubious distinction, in this case I think they got the award right, and the 0888 is certainly worthy of the Knife of the Year title. The 0888 features a modified drop point blade. It’s almost a spearpoint, and that spear shaped blade is further accented by a dramatic fuller that runs the length of the blade before transitioning into the handle. The knife is flat ground, with the grind running half the height of the blade. There is no swedge. The “MAX” in 0888MAX signifies ZT’s choice of Carpenter’s Maxamet high speed powder tool steel. Here is a link to Carpenter’s datasheet. Here is a link to ZKnives always informative Composition Analysis Graph, Equivalents and Overview. After reviewing Carpenter’s datasheet, it looks like Maxamet is to be hardened to anywhere between 66-71 HRc, which is super high on the Rockwell C scale for knife blades. For reference, steels like S110V and ZDP 189 are taken up to the low 60s (maybe as high as 65 for ZDP-189). According to Zknives, ZT had trouble grinding the Maxamet blades after heat treat, and experienced issues with warping if they ground the blades before heat treat. That is why they did not make the full 250 piece run of 0888MAXs in Maxamet, and that is what makes a “real” Maxamet clad 0888MAX so special. This all sounds great, but since I have not used this knife I cannot comment on the real world implications of a knife with a Maxamet blade. I can’t imagine it being easy to sharpen. The 0888 comes with a 3 piece titanium handle. I love the absence of visable hardware except for the custom pivot on the show side. The end result is an exceptionally clean and elegant knife; especially when you consider that this was released several years ago. These days we are seeing more integral designs hit the market, but at the time that wasn’t the case. The handle has a full titanium backspacer tastefully engraved with the “Zero Tolerance” wordmark. The overall fit, finish, and execution of the handle is fabulous. Your fingers catch on the fine, almost herringbone, machining on the handle. The backspacer and handles are almost seamless, and the lockbar is precision cut. 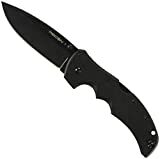 The all black MAX version is especially seductive, lending the knife a stealth fighter feel. The 0888 is a large and comfortable knife. It’s simple shape provides the end user with excellent ergonomics. Again, I haven’t cut with this knife, or carried it, so I can’t offer much besides impressions after handling it. If you were to use it my best guess is that it would feel great. There is no jimping to speak of. The pocket clip is also quite special. It’s a one piece ambidextrous tip-up pocket clip. Again, it is beautifully finished and 3-d machined from a single piece of titanium. This is easily the most elaborate clip I have ever seen on a knife. It is secured by a single phillips screw hidden from view unless you look down into the inside of the handle. I haven’t carried my 0888MAX. It’s a big heavy knife, and my guess is that you would really feel it in the pocket. Not my choice for an every day carry piece, but definitely a cool collectible. The 0888 is a bearing equipped flipper. The action is crisp and smooth, and the knife opens with a distinctive metallic click. After disengaging the lock you can shake the blade closed. Blade centering is perfect on my knife. As with some ZTs, you need to keep your finger off the lock bar when using the flipper. The 0888 is a titanium framelock with replaceable steel blade insert. I think having a steel insert is especially prudent with this Maxamet blade. If the blade is truly hardened to 66+ HRc, it will chew through a titanium lockbar. A steel insert is essential here. Lockup on my knife is early and secure. There is no blade play, and the lock does not stick. Typical ZT quality here. They have the 0888 dialed in just as good as any other Zero Tolerance framelock I have handled. It is a privilege to share a knife like the 0888MAX with you. I occasionally run into some cool stuff, but largely stay within the realm of normal production folders. I don’t own many custom knives, nor do I spent a lot of time in the midtech market. With all that in mind, the 0888 is a special piece unlike anything else I have reviewed. Even compared to my 454CF or Shirogorovs this 888 is a totally different knife. I think it is especially interesting that this is an in house design. That is a testament to the team they have built over at Zero Tolerance. Given the somewhat “funky” nature of the new ZT LE’s I think they should consider another in house design. Clearly they have some talent over there, and I think an overreliance on custom maker designs may be a step in the wrong direction at this point. The 0888MAX is no longer available at retail, and they rarely appear on the secondary market, but if you are in the market for a Zero Tolerance knife, please consider purchasing it at Amazon or BladeHQ. By purchasing things through any of the links on this website you support BladeReviews.com, keep the website free of annoying banner ads, and help produce future reviews. Thank you very much.